Union General George B. McClellan’s Army of the Potomac, having retreated to the James River and holding the high ground on Malvern Hill, is now within the protective range of Federal naval warships. 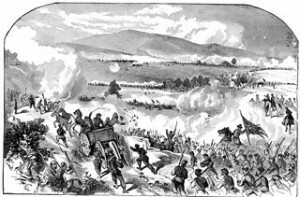 Confederate General Robert E. Lee, during today’s battle–the Battle of Malvern Hill, the final battle of the Seven Days Battles–in vain attacks the Union Army. Poor communication among Confederate officers and well-placed Union artillery result in a clear day’s victory for the Union. Lee finally gives us as night falls, in the face of nearly 8,000 casualties, almost 5,700 from the Confederate side. The Union victory, however, is hollow. McClellan has been pushed back from Richmond, and following a time of recuperation on the banks of the James River, the Army of the Potomac is ordered to relocate to Northern Virginia. Lee, meanwhile, having saved Richmond, is a Southern hero. The victory over McClellan energizes and shifts momentum to the South. For the next two years, the Confederate general’s daring strategic moves will confound the North and prolong the war as an increasingly beleaguered Confederate Army refuses to believe their cause is hopeless. While McClellan is achieving a meaningless victory in the midst of retreat, the U.S. Congress passes and President Abraham Lincoln signs the Pacific Railway Act. The act designates the route of the western railroad and offers land grants as incentives for private companies to finish developing the rails west of the Missouri River. Most importantly, it assures that the western railway will remain in Union hands, opening up the expanse and resources of the great West to the United States, even as the Southern Confederacy’s land holdings are slowly shrinking from steady Union advances in the Southwest and Southern coastal areas at large. While the war continues for almost three more years, the North’s advantage of land and resources inevitably prevail over the courage, cunning and determination of the smaller Confederate Army. As the conflict over African slavery rages on battlefields and permeates politics, the future of the South is quietly foreshadowed in the small town of Denbigh, Virginia, near Newport News. The Lower Peninsula along the Virginia coast, including Denbigh, is now occupied by Union forces, who have freed African slaves in U.S. controlled Southern territories. The Denbigh Baptist Church, a white-controlled church, has been abandoned by its white leaders. This month, former slave members, now freedmen, meet in the church house and form an autonomous African congregation. The First Baptist Church of Denbigh is thus reborn, representing a growing pattern of freedom and autonomy of former slaves that contradicts current white Southern claims that Africans are living happy and fulfilled lives as slaves. At least two freedmen members of the Denbigh Baptist congregation serve in the Union Army, Company G, 36th USC7 Infantry: Anthony Poole serves as a Sergeant, while Edward Diggs obtains the rank of Corporal, serving in the U.S. Army until October 5, 1866. Following the war, the white members of the original Denbigh Baptist Church reclaim the building, leading the African congregation to build their own meeting house. The congregation’s second pastor, Rev. T. G. Wright, becomes the first ordained black minister in Warwick County, while one of Wright’s sons becomes the first black lawyer in the county. Under Wright’s leadership, the church grows to some 450 members. The community of Denbigh no longer exists, having been incorporated into Newport News in 1958. First Baptist Church Denbigh, however, remains to this day.